Natural beauty glows on with a versatile, lightweight makeup collection that effortlessly creates healthy colour. 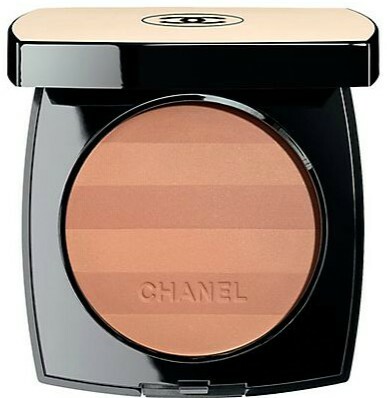 Multi-shade compacts enhance the complexion, while creamy colour sticks brighten and contour cheeks. With the release of the limited edition LES BEIGES DE CHANEL 2015 collection the brand sought to expand on their wonderful and ever popular Healthy Glow products. These Healthy Glow products are perfect for Summer and are a "MUST HAVE" staple for the beach or vacation! This collection features nudes and healthy glow products to keep you safe while out in the sun all the while looking fresh and beautiful with healthy glowing skin! Lightweight, multi-colour powder offers a palette of effortless effects. Acts as a highlighter, sculpting powder, bronzer and blush - all with a sheer, natural finish and broad-spectrum sun protection. Contains .39 oz of product. With an effortless touch, this innovative, versatile powder makeup enhances, brightens or bronzes the complexion for a custom glow. On its own, it heightens skin's natural beauty; over foundation, provides a sheer, luminous finish. Advanced technology protects against skin-dulling environmental stressors, while White Rose and Cotton Flower offer absolute comfort for even the most sensitive complexions. In seven no-fail shades; each, with its own sculpted half-moon brush. Creamy formula blends seamlessly with skin to enhance, brighten and contour. Healthy-glow shades help sculpt cheekbones or refresh the complexion with a vibrant, velvet finish. Presented in a sleek, portable black case with beige 'CC' monogram. Contains .28 oz of product. Comforting balm veils lips in sheer matte colour, while softening and smoothing. Presented in a sleek, portable black case with beige 'CC' monogram. Contains 0.1 oz product. Classic and trend-defining shades in an exclusive formula that strengthens and moisturizes nails as it delivers high-shine colour. Applies evenly without streaking. All Chanel nail products are formaldehyde-free, toluene-free and DBP-free. Using built-in brush applicator, lightly apply colour to nails. Let dry and reapply colour until desired intensity is achieved.